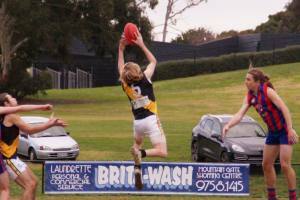 In the middle of school holidays we were short on numbers, however, Ringwood were in the same predicament. So a game of nine versus nine was played. The low numbers meant there was plenty of space to run and carry and for the boys to showcase their skills. Jack, Coby and Zac M were giving us first use in the middle while Tom, Connor and Xav were kicking them though the big sticks and Cody, Oscar and Billy (from un8's Yellow) were rock solid in defence. The running handballs and long kicking was great to watch and boys were teaming up well and as a result we kicked our highest score for the year with most of the boys kicking a goal if not a couple. Medal winners. Tom and Zac M.
The U9 Yellow boys played an amazing game of football today against a very strong Vermont team who played a great brand of football. Our boys were slightly ahead all game due to playing as team and using the ball really well. Our Captain today Alex Griffiths played a great game of football and was always in front when the ball came his way. Our use of the ball, run and skills were on show today, which was a credit to all the boys. They have been training hard and it came out today in a low scoring match with a stiff breeze. We had match winners from full back, to the full forward and everywhere in between. Our back line was exceptional all game a repeal many attacks from Vermont. The Two Brothers Cafe awards went to Will Jesse for his never say die efforts across half back and presenting at Centre Half forward when moved forwards. The other two Brothers Cafe award went Lucas Hays for his continued improvement and confidence in being first to the ball. The MFC Medal for Players of today was awarded to two players. The first always plays an exceptional game when in the backline. He takes on the responsibility well and positions nicely to make a contest or be in front. Great game Oscar Tribolet really well played. The final Medal for today's game went to Ryan McConnell, one of our best defensive runners. He loves to attack the ball and sneaks up on players with his speed and determination. Great game Tigers!! 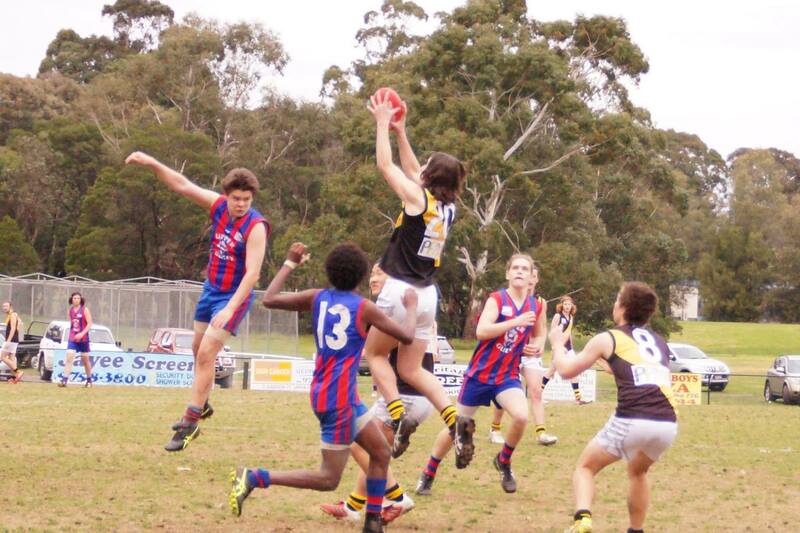 Today we headed down East Link to take on Lysterfield, a team we had played well against earlier in the season. Our captains were Steve Stansfield and Jackson Doherty, 2 boys who have been playing some good footy of late. We cracked in hard in the first quarter and although neither team scored, we felt we had more control than Lysterfield. We fell away a bit in the second quarter and our heads seemed to drop and the game slipped away from us in what seemed like a blink of an eye. 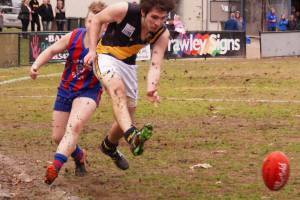 We couldn't get our mojo back and Lysterfield's confidence grew and they kicked some nice running goals against us. Mitcham Black U10 went down the road to play a very talented Norwood side. This game was a real challenge for the boys with Norwood being the best team we have played for the year and having several talented players out. Captains for the week were Liam who brought a true leadership approach to the game and Jaylen who took the role very seriously by playing one of his best games for the club. Norwood started the game controlling the play and we were second to the ball. The boys were very competitive for the rest of the game but Norwood proved a very talented side. This game was one of the best marking games of the year with Jaylen taking close to 12 marks. Matt, Paddy and Gabe also too really strong marks just to name a few. With only two home games remaining you can clearly see the improvement in all the boys. Today the Under 11’s travelled to Mullum Reserve to take on the surging Norwood. The boys dominated in the clearances but couldn’t turn their efforts into scoreboard pressure. Norwood did make the most of their opportunities scoring 1 goal and 1 behind in the first quarter. The second quarter was spent mostly in our forward line with the boys being rewarded with 2 goals 1 behind for their efforts. The arm wrestle continued in the third with Norwood scoring 1 goal 2 behinds. The final quarter was the first where both sides scored with each team scoring just 1 behind resulting in a 2 point win to Norwood. Under manned with no rotations the boys gave it all to just fall short a win. To draw with an east Ringwood side that had 6 on the bench shows my boys leave it all on the park. My theme today was commitment. And for 50% of the game I think the boys kept their commitment. However, if we were going to beat the top side, we needed the boys 1 commitment to be for 100% of the game. Having said that, I thought Dan T, Nathan, Sasha, and Dan N all kept their commitment to the game. Notably, Dan T was a stand out. Dan's commitment to win against his opponent every single time was great to watch. There was one piece of play from Dan T that had all Mitcham supporters cheering for him with his effort in running 50+ metres to chase down his man, which ended up resulting in Mitcham gaining a scoring opportunity. Well done on your commitment medal. That’s your benchmark for the rest of the year. While we lost today, Glen Waverley Hawks showed how we need to play if we are to have success in finals. Today was just one of the those days where the bounce of the ball didn't go our way, however, I am still confident and believe the boys can make finals. 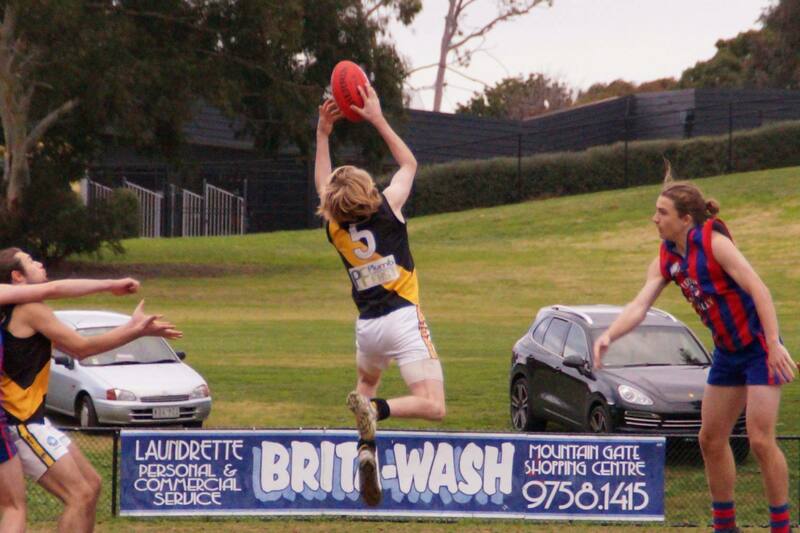 Lets continue to train hard, and commit to be at our best against Wantirna Sth next week. 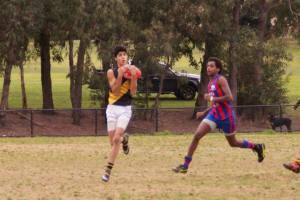 Unfortunately a 7 goal to 1 first quarter saw Donvale take complete control of our round 12 clash. After quarter time we went goal for goal but the damage was done. In such an important game it was a very disappointing result. On a positive note Wil Drake and Ethan Wu had good games with their never give in attitude was a lesson and example on how to play 4 quarters of contested footy. Today we took on Upper Ferntree Gully at their home ground. This game was a crucial one as once again we were down a bit on numbers and some players were playing out of normal position. Our focus was to work on the team things and possess the ball and get our forwards into good scoring positions. 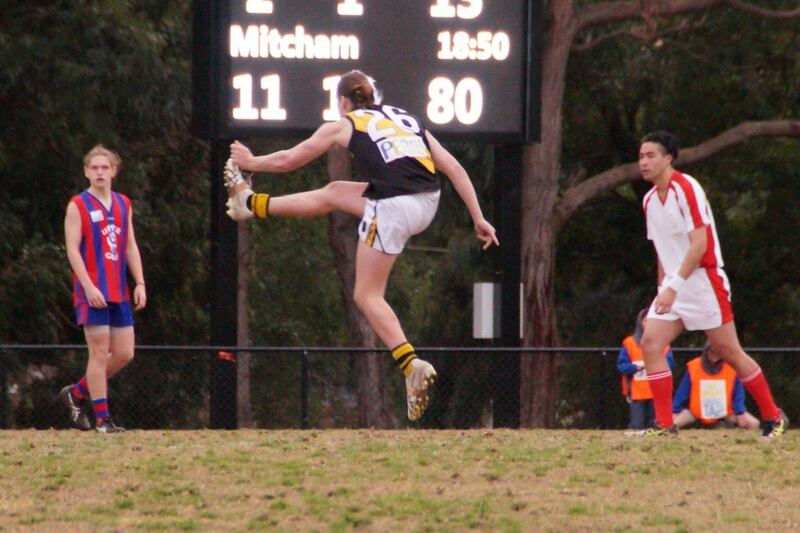 At the first bounce our mids went into overdrive and controlled the game from the start. They worked the ball forward at every occasion and our forwards did the rest, with the Squirrel kicking the first three and our other smalls getting on the end of a couple. To UFG’s credit they didn’t lie down and concede, they did work the ball forward on occasions but our defence led by Tommy and Maxxy with Spitta mopping up the scraps at every opportunity. The scoreline was a little bit irrelevant after the first and I asked the boys to work hard on the structures we have put in place which at times were forgotten and UFG got a bit of a run on. Once we got ourselves back to how we normally play we shut them down pretty quickly. After the main break, a few changes were made with Horse and Maxxy going into the centre. They both had a massive impact winning clearances at will and set up many scoring opportunities. These new options are going to be critical come finals as it allows us a few more rotations on ground. By the end of the game we had a massive total on the board and it was encouraging to all the coaching staff how well we adapt to all conditions. Great to see Big Zebby back after a long stint on the injury list and he smashed packs without fear of hurting himself. He will only get better for the run. Mentions got to a few players for consistent four quarters Maxxy, Jaydos, Timmy, Spitta, Horse, Benny A and Jimmy. Everyone had an impact today. Keep up the hard work boys, we have a big game next week, one we should all be looking forward to. Go Tiges!!!! !